Still working on my Sampson County, NC kin here. 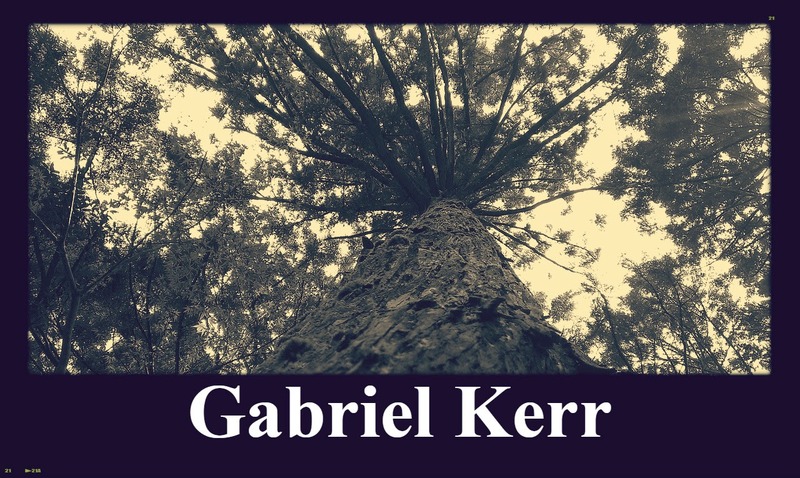 Gabriel Kerr's story I've begun to uncover. It's not the perfect rags to riches story but Gabe definitely came a long way in his lifetime. Gabriel Kerr was my 2nd great grandfather Henry Kerr's brother and another child of Jacob and Clara Kerr, my 3rd great grandparents. Based on his age shown on the 1870 Federal Census, he was born around 1847 in Franklin township, Sampson County. Back in 1870, Franklin was part of New Hanover County, NC. Source Citation Year: 1870; Census Place: Franklin, New Hanover, North Carolina; Roll: M593_1151; Page: 212B; Image: 136; Family History Library Film: 552650Source InformationAncestry.com. 1870 United States Federal Census [database on-line]. 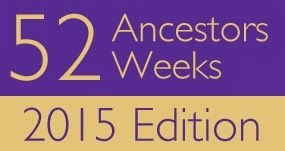 Provo, UT, USA: Ancestry.com Operations, Inc., 2009. Images reproduced by FamilySearch. Now eight short years after the end of the Civil War, Gabe Kerr and his father Jacob Kerr were able to pay off a bond that was owed to the estate of James Kerr, a wealthy Sampson County farmer. The were issued a deed to land they owned jointly on March 6, 1873 to 577 acres of land. 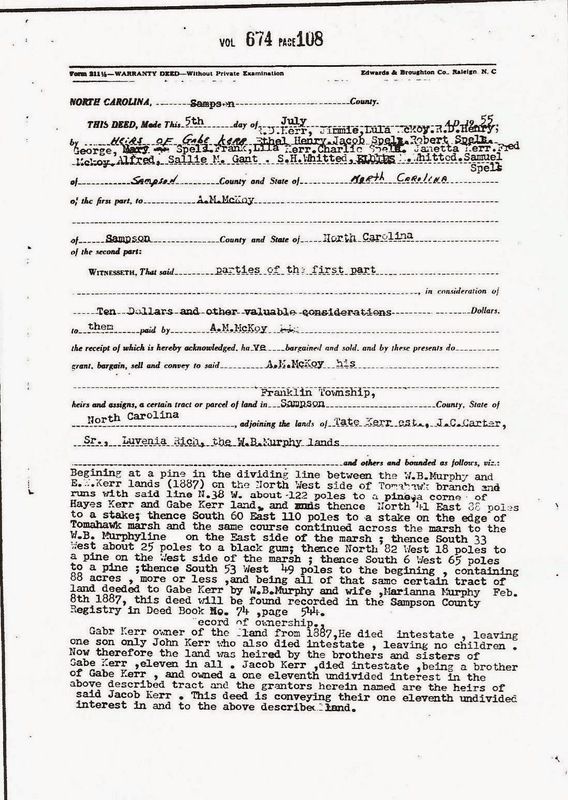 (Click here to see a copy of the deed.) This wouldn't be the only property purchased by Gabe that year. My 2nd great granduncle made another purchase of land on March 20th 1873 from a man named Edward Rich and his wife Terasy of Bladen County. The deed for this purchase and others I will transcribe in future posts. For now, I will summarize that this particular purchase was for 3 separate pieces of land amounting to approximately 227 acres, all located in Sampson County for $498.50. This I find to be absolutely amazing considering again that it was just eight years after the end of the Civil War. But of course there's more. On July 8, 1887, Gabe purchased from a W. B. Murphy and Marianna Murphy 88 acres of land in Sampson County for $176.00. I am so glad that I started reviewing through the deeds of various Kerr family members. Initially when I started looking through deeds on the Sampson County Register of Deeds Remote Access Site, I was just looking for the deeds of 3rd great grandfather and 2nd great grandfather, Jacob and Henry Kerr. Then I became curious about Henry Kerr's siblings and then before you know it I was scrolling through the names of their descendants in the online index. (Can you tell I have an attention deficit issue?) Anyway, I don't recall how I got to this particular deed but it was the impetuous that made me take a closer look at Gabe Kerr. This is the part that really got my attention. Gabe Kerr had a son! Which means he probably had a wife too. Who was she? 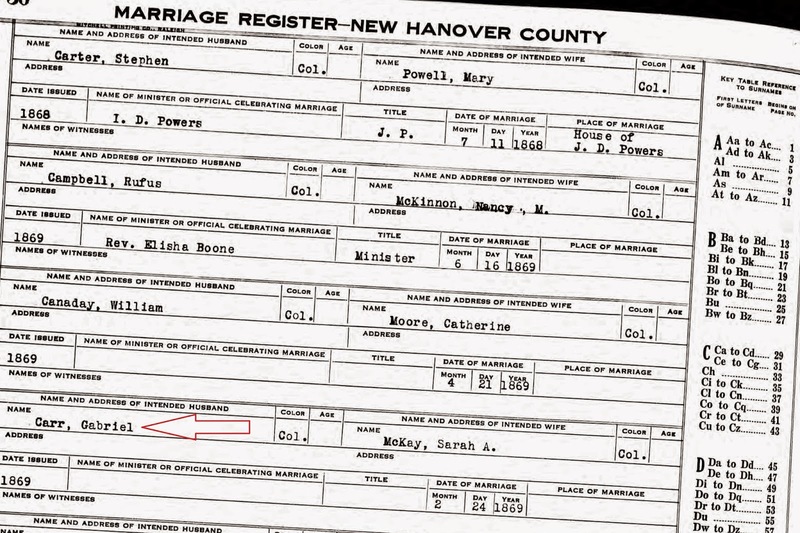 I found out what her name was on another deed. Aha! Her name was Julia Ann. Don't know what her maiden name was but hey it's a name, so I'll take it. This was from a deed dated May 25, 1889. Gabe Kerr sold to J. D. Johnson 42 1/2 acres for the price of $106.25 cents. Remember that name J. D. Johnson. It's going to show up again later. The last name is spelled differently here but alternate spellings are always something to keep in mind when doing research. I'll have to keep digging to see if this is in fact referring to my Gabriel. I learned that my 2nd great grand uncle had a charitable heart. On April 28, 1890, Gabriel and his wife Julia Ann sold 3/5 of an acre of land for the sum of $2.00 to the trustees of St. Stephen's African Zion Methodist Episcopal Church in Garland, NC. Here's an excerpt from that deed. "to have and to hold the aforesaid tract or lot of land and all privileges and appurtenances whereto belonging In Trusts that said premises shall be used kept maintained and disposed of as a place of Divine Worship for the use of the ministry and membership of the African Methodist Episcopal Zion Church in America." I have to do some research on St Stephen's AME Zion Church in Garland, NC now. Sounds like to me that this was the family's place of worship. 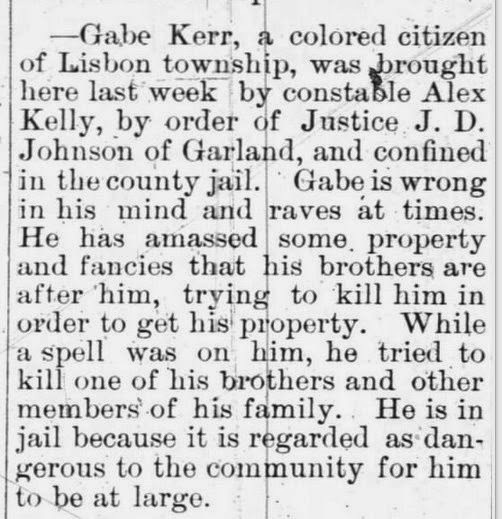 Sadly, it appears that as time went on Gabriel Kerr had some mental health issues. I immediately felt bad for Gabe and the rest of the Kerr family when I read this. It seems to me that he was suffering from some form of paranoid schizophrenia or something to that effect. Since he was able to function in society pretty well prior to this, I bet he would have benefited from the medicines and counseling we have available nowadays for mental health issues. Did you catch the mention of "Justice J. D. Johnson of Garland" here? I believe that this is the same J. D. Johnson that Gabriel sold land to in May of 1889. In any event my 2nd great grand uncle was sent to jail, an environment which probably didn't help his condition. Or did it? Why might I say that? It looks like Gabe's health improved enough that in a few short months after the newspaper article was published, he was well enough to sell two pieces of property. On November 2, 1895, he sold 3 1/8 acres in Lisbon Township, Sampson County, NC to J Z Rich for $15.00. On the same day he sold 3/4 acre of land also located in Lisbon Township to E. C. Herring for $3.75. These are the last records I've come across mentioning Gabe Kerr. This snippet from a Wilmington newspaper may give an indication of how and when my 2nd great grand uncle died. Gabriel Kerr was a wealthy man, Andrea, ambition is wealth. I am glad he was able to realize some of his dreams before he passed. He was married he had a child, he owned land, an abundance of love is wealth. Great post! Thanks so much for your kind words and for including my post in your Noteworthy Reads!